The Center for Veterinary Public Health at the Maryland Department of Health and Mental Hygiene is sponsoring a poster contest with the theme “You Can Prevent Rabies.” The poster contest is being held in recognition of World Rabies Day 2008, and is open to all Maryland students in grades 5-8. Posters should illustrate the ways people and communities can help prevent rabies. Students will be divided by grade into two groups: 5th and 6th graders and 7th and 8th graders. All entrants will receive a World Rabies Day bookmark. First, second and third place prizes will be awarded in each of the two groups. The first place winner in each group will receive a World Rabies Day messenger bag and choice of: 2 tickets to the National Aquarium in Baltimore, or 4 tickets to the Maryland Science Center, or 4 tickets to the Maryland Zoo in Baltimore. Submissions are due by October 24, 2008 and winners will be announced on November 14th, 2008. For more information visit http://edcp.org/vet_med/rabies.html, or call 410-767-5649. This entry was posted in Poster Contest, World Rabies Day on October 8, 2008 by yourfriends. The cry went up as a bald, three-legged, one-eyed dog from Florida was honored as the “World’s Ugliest Dog” at the 20th annual ugly dog contest at the Sonoma-Marin Fair in Petaluma, Florida. 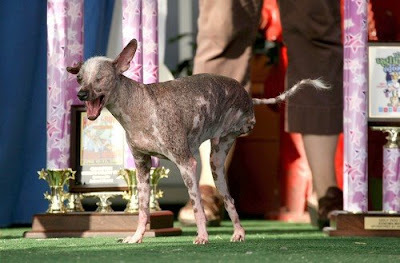 Gus, a hairless, Chinese-crested with skin cancer, was named 2008’s ugliest dog at the contest after competing with 11 other dogs from across the nation. Gus won in the pedigree class and went on to triumph in the overall competition. He took home two trophies and $1,600 in prize money, which his owners are going to spend on radiation treatments. Gus has skin cancer, which led to the amputation of one leg. His missing eye is the result of a fight with a tomcat. This entry was posted in Gus, World's Ugliest Dog on October 5, 2008 by yourfriends. 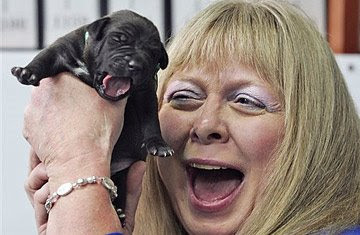 After loosing her dog Booger to Cancer, Bernann McKinney had him cloned. Cells from her beloved pet were transported to RNL Bio lab based in Seoul, Korea. The cells were nutured and developed into embryos. The embryos were transplanted into two surrogate mixed breed females who carried them to term. Five cloned puppies were born at a cost of $50,000. Ms. McKinney is the world’s first commercial cloning client. She plans to take three of the cloned dogs to her home in California and donate the others to work as service dogs for the handicapped or elderly. McKinney said she was especially attached to Booger because he saved her life when she was attacked by another dog three times his size. The incident resulted in her left hand being severely injured, and also damaged her leg nerves and stomach. Doctors later reconstructed her hand and she spent part of her recovery in a wheelchair. This entry was posted in Clone on October 3, 2008 by yourfriends.